To find the 'Budget Report', go to the tab 'Reports' -> and under 'Schedule' -> 'Budget'. 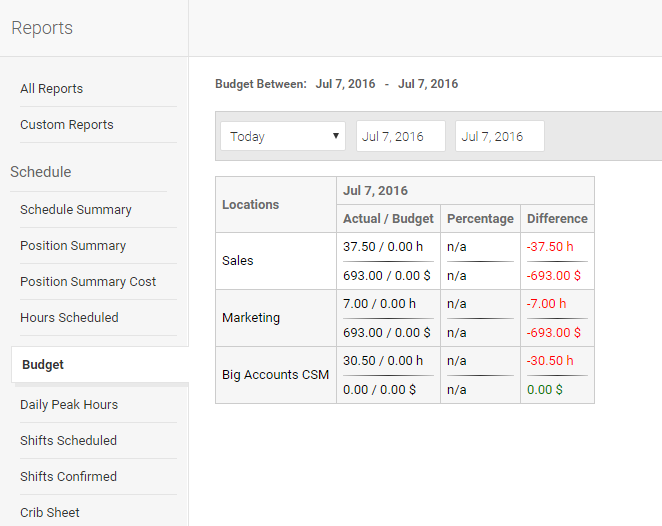 The 'Budget Report' shows your 'Actual' Scheduled Hours/Income against your set 'Budget' Hours/Income by 'Location'. If you are under budget the 'Difference' will be shown in green and if you're over budget it will be shown in red. Select a time period as well as the options to 'Print Report' or 'Save CSV'.